Yes! You CAN Leave Home without Them! 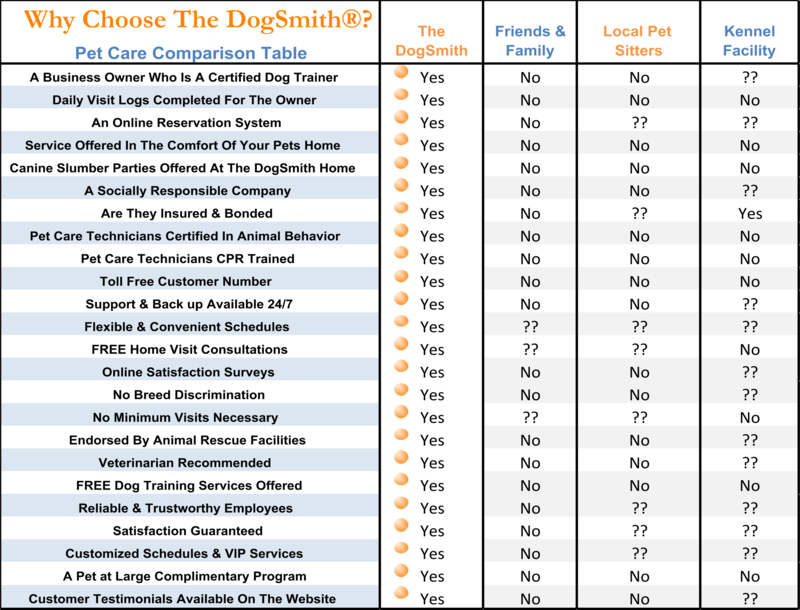 The DogSmith has created the perfect Pet Care Program that allows you the flexibility to care for your pet and reclaim your freedom. With The DogSmith’s pet care program you’re never torn between the demands of your jo b, social life or family, and the needs of your pets. Our pet care program is specifically designed to give you the peace of mind that comes from having the best of all worlds. If you are leaving town for a few days or just a few hours your DogSmith can help you. If you have extended hours at work or miss the chance to get home at lunchtime, then we have just the service for you. 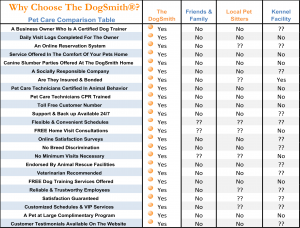 The DogSmith Pet Care Programs – Services for Every Occasion! DogSmith Lunch Break or Dinner Break. A short visit to give your pets some much needed leg stretching. The midday visit is between 10:15 a.m. and 2:30 p.m. and the dinner visit is between 4:00 p.m. and 8:00 p.m. 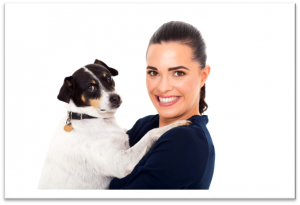 Schedule your free home visit consultation with your DogSmith. At this time we can complete all the necessary paperwork. It gives us a chance to meet you, your pets and become familiar with your home. Schedule your dates in our pet care software. Yes, you have full control and can add and edit appointments whenever you like. We can also do this for you if you prefer to email or call us. Your DogSmith will collect your keys, store them safely and use them when they are scheduled to visit your home. Your service visits. At each visit your DogSmith leaves notes about your home, your pet and their health and wellness. These notes can also be added to our software so you can track them from anywhere in the world. Your DogSmith will also text, email or call you with an update. Whichever you prefer. Return home to find your home and your pets (and yourself) stress-free! We also have a selection of add-on services to make each visit even more FUN for your pets. Talk to your local DogSmith to learn more about our services. All DogSmith pet care providers are bonded and insured, certified Pet Care Technicians and certified Pet First Aid Responders. Schedule a dog walk, a training session, a fun fetch session, or just one on one snuggle time. To schedule any service please Click here. We will then contact you to schedule your service.